Before the start of the 1928 World Series, former major-league pitcher Walter Johnson predicted, “To me, the St, Louis Cardinals should make short work of the New York Yankees. The Yankees don’t look good. They haven’t looked good for a while.”1 The Big Train couldn’t have been more wrong. Going into Game Three at St. Louis’s Sportsman’s Park, the Yankees were riding high with resounding wins in the first two games. Babe Ruth, Lou Gehrig, and Bob Meusel had provided most of the firepower in those games, prompting Ruth to say, “We served notice that from here on out, there’ll be a lot of dynamite in those Yankee bats.”2 His proclamation would turn out to be true. In fact, not only had the Yankees’ bats inflicted damage on Cardinals pitching, but also New York pitchers Waite Hoyt and George Pipgras shut down the Cardinals’ potent offense, yielding just seven hits in the first two games. The paid admissions for Game Three were 39,602, but The Sporting News estimated that 42,000 were in attendance, a Sportsman’s Park record. This suggested that Cardinals fans were still enthusiastic about their chances despite what happened in Games One and Two.3 The Cardinals had planned to sport new uniforms for this game, but manager Bill McKechnie had to abandon that idea for his regulars when uniforms for several of the players were too small. A few of the reserves did wear the new uniforms.4 However, sartorial splendor would turn out to be the least of McKechnie’s problems. 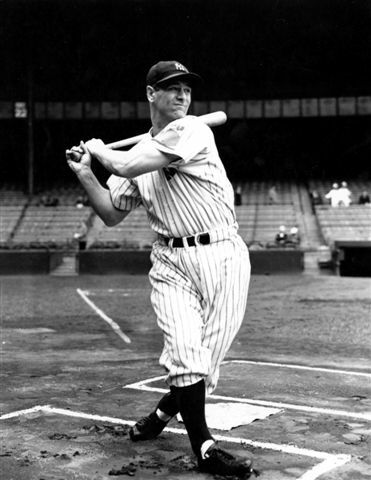 With Herb Pennock unavailable to pitch in the Series because of a sore arm, Yankees manager Miller Huggins turned to 32-year-old journeyman Tom Zachary to face the Cardinals in Game Three.5 The Yankees had acquired Zachary from the Washington Senators in a waiver deal on August 23 to shore up a pitching staff beset by injuries. He wound up winning three games in six starts during the regular season. Jesse Haines, a 20-game winner during the regular season, drew the starting assignment for McKechnie. The 35-year-old’s World Series experience included two wins over the Yankees in the 1926 World Series, won by the Cardinals. The Yankees responded in the top of the second inning on Gehrig’s solo home run into the right-field pavilion, his second of the Series. Zachary pitched out of a jam caused by errors by third baseman Gene Robertson and second baseman Tony Lazzeri in the bottom half of the inning. After Ruth singled in the top of the fourth inning, Gehrig laced a screaming line drive into center field, where Taylor Douthit tried to make a diving catch, but the ball skipped past him and rolled to the flagpole. The other two Cardinals outfielders were unable to back up Douthit because the ball had been hit so hard.7 Gehrig raced around the bases for an inside-the-park home run, with Ruth scoring ahead of him to give New York a 3-2 lead. Combined with the two earlier Cardinals losses, Gehrig’s freak round-tripper seemed to take the wind out of the Cardinals’ sails. Zachary yielded the Cardinals’ third run in the bottom of the fifth on Andy High’s double, which scored Douthit, who had been hit by a pitch. This tied the score, 3-3. But the Yankees rose to the occasion again in the sixth. With Haines still pitching, the Yankees scratched out three unearned runs thanks to a bizarre, Keystone Cops type of play. Ruth reached first base when his grounder to second forced Mark Koenig, who had singled. After Gehrig drew a walk, Meusel hit a groundball to third baseman High, who attempted to start a double play. High’s throw to second forced Gehrig, but Frisch’s relay got past Bottomley and the ball rolled to the fence behind first base. As Bottomley ran to retrieve the ball, Ruth rounded third base and started for home. Bottomley’s throw to catcher Jimmie Wilson beat Ruth at the plate. Umpire Bill McGowan initially called Ruth out, but Ruth’s aggressive slide jarred the ball loose. McGowan changed his call and the Yankees were back on top.8 Wilson recovered in time to fire the ball to second in an effort to nab Meusel, who was advancing on the throw home, but no one was covering the bag – Frisch was still sprawled on the ground, where Gehrig had knocked him head-over-heels on a takeout slide. The ball sailed into center field and Meusel ended up at third. Tony Lazzeri then walked. With Gene Robertson batting, Meusel and Lazzeri executed a double steal, on which Meusel scored. Lazzeri then scored on Robertson’s single, making the score 6-3. The Yankees scored another unearned run in the seventh inning, while Zachary held the Cardinals scoreless after the fifth, for a final score of 7-3. The Yankees optimized their seven hits, turning them into seven runs, while the Cardinals could manage only three runs on their nine hits. Zachary’s complete-game win included one walk and seven strikeouts. It was his third victory in World Series competition. Haines, who was relieved in the top of the seventh inning, took the loss for the Cardinals. The Yankees’ Game Four win two days later allowed them to gain revenge for their loss to the Cardinals in the 1926 World Series. The championship also evened their overall World Series record at that point at 3-3. Cantor, George. Inside Sports World Series Factbook (Detroit: Visible Ink Press, 1996). Creamer, Robert W. Babe: The Legend Comes to Life (New York: Simon and Schuster, 1974). Gallagher, Mark. The Yankee Encyclopedia 6th Edition (Champaign, Illinois: Sports Publishing, LLC, 2003). Krueger, Joseph J. Baseball’s Greatest Drama (Milwaukee: Joseph J. Krueger, 1945). 1 Leigh Montville, The Big Bam (New York: Doubleday, 2006), 275. 2 Mike Eisenbath, The Cardinals Encyclopedia (Philadelphia: Temple University Press, 1999), 452. 3 “Three Straight for Yanks Upsets All Predictions,” The Sporting News, October 11, 1928: 3. 4 “Gossip of the Game,” The Sporting News, October 11, 1928: 5. 7 William McKechnie, “We Presented Yanks with 6 of 7 Runs, Says M’Kechnie,” St. Louis Post-Dispatch, October 8, 1928: 13. 9 “Yanks Make Merry; Cards Are Silent,” New York Times, October 8, 1928:17. 10 Charles Dunkley, “Ruth Kicked the Ball Out of My Hand, Says Jim Wilson,” St. Louis Post-Dispatch, October 8, 1928: 13. 11 New York Times, October 8, 1928:17. 12 Babe Ruth, “Ruth Believes Cards’ Morale is Broken,” St. Louis Post-Dispatch, October 8, 1928:14. 13 New York Times, October 8, 1928:17. 14 At the end of the 1928 World Series, Ruth held single-season World Series records for batting average (.625) and runs scored (9) and was tied for the lead in total bases (22), while holding second place in OPS, or on-base plus slugging percentage (2.022). Gehrig led all players in on-base percentage (.706), slugging percentage (1.727), OPS, (2.433), and home runs (4), and was tied for first in RBIs (9). As of 2017 Ruth was still tied for first in total bases and in third place in batting average and runs scored. Gehrig still held the record for slugging percentage and OPS.